As you may know, “Origami” is a traditional Japanese paper-folding activity passed down for generations. 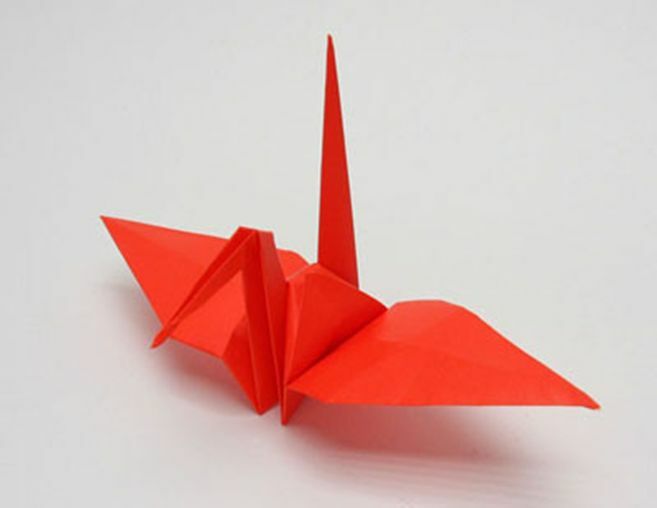 If you grew up in Japan, you would have most likely made cranes, birds, boats, and many other things using colored square papers in kindergarten and in elementary school. Unfortunately, since origami is seen mostly as a hobby for young children, as one grows older, opportunities to fold origami often decrease. However, the world of origami is actually very wide and deep, and origami is just too amazing to grow out of! As part of my research work at the university I work at, I am researching on shapes that could be created by folding paper. Surprisingly expressive shapes can be made by folding a piece of paper, and even after becoming a university professor, I still get excited over the beauty beyond expectations of the figures and shapes that can be created from a single piece of paper, and the unexpected shadows they create. The process of folding a paper is equivalent to the process of connecting points with the line made by the crease line, and also to the process of inverting the figure on the line by folding, and is very useful in learning geometry. For example, by folding a triangle in half to fit together two of the sides, the inner center theorem, in which the bisector of the angles of the triangle intersects at one point, can be easily confirmed. If you know how to fold the popular paper crane origami and have a few extra minutes, fold one, and then unfold it and observe the creases that were made in the process. You will make many discoveries such as congruent triangles, pairs of similar triangles, bisections of angles, and perpendicular bisectors. Finding out that origami is related to math terms that come up on exams might make you feel like it is necessary for you to “study” origami, but that may take the joy out of origami, and even might make you dislike it. Origami is too good and beautiful for that! Let us break loose and jump out from these math problems, and take a look at the joy and the wide possibilities of origami. When we were young, origami was something taught by teachers and parents. By accurately copying the folds of the origami one by one, we successfully end up with the final shape, but origami is so much more than just following the instructions provided and copying the folds. You can freely make whatever shapes you want, and it doesn’t even have to be something flat! Folding a curved crease in any way you want to is absolutely okay. 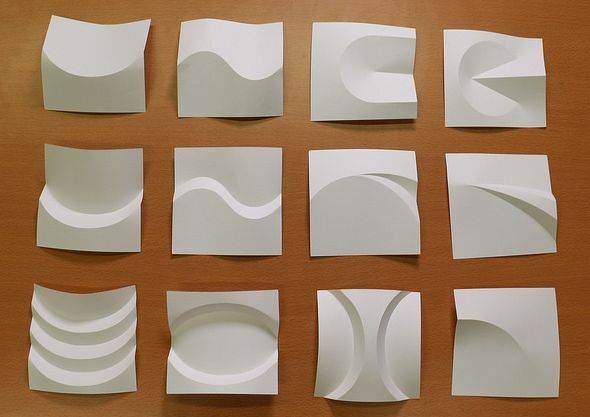 Pictured below are pieces of square papers folded freely by curved creases. Did you know that you can make beautiful shapes like these just by folding a few curves? Just by folding a single piece of paper, a surprisingly beautiful shape sometimes emerges, and that would certainly allow origami to join the ranks of “art”. Using my knowledge of my field of research, geometric for computer graphics, I am now challenging to make unique new shapes for origami. One of them is origami shapes that are folded by curved creases, and has curved surfaces. 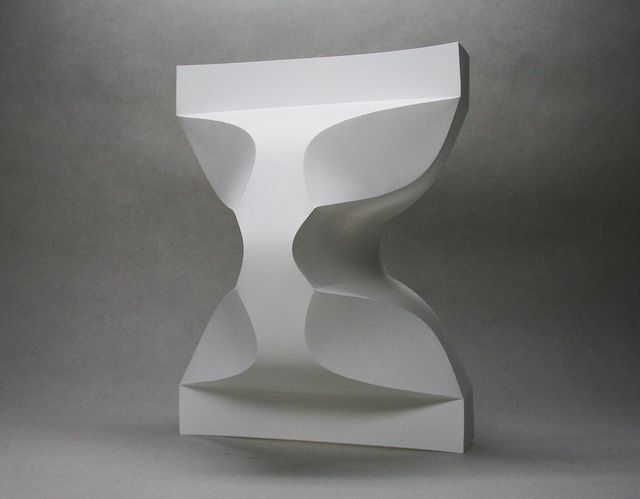 It is known that the only curved surfaces that can be made from paper are the cylindrical surface (similar to the cylinder), the conical surface (similar to the cone), and the tangent surface (a surface), and there are not many shapes that can be made this way. 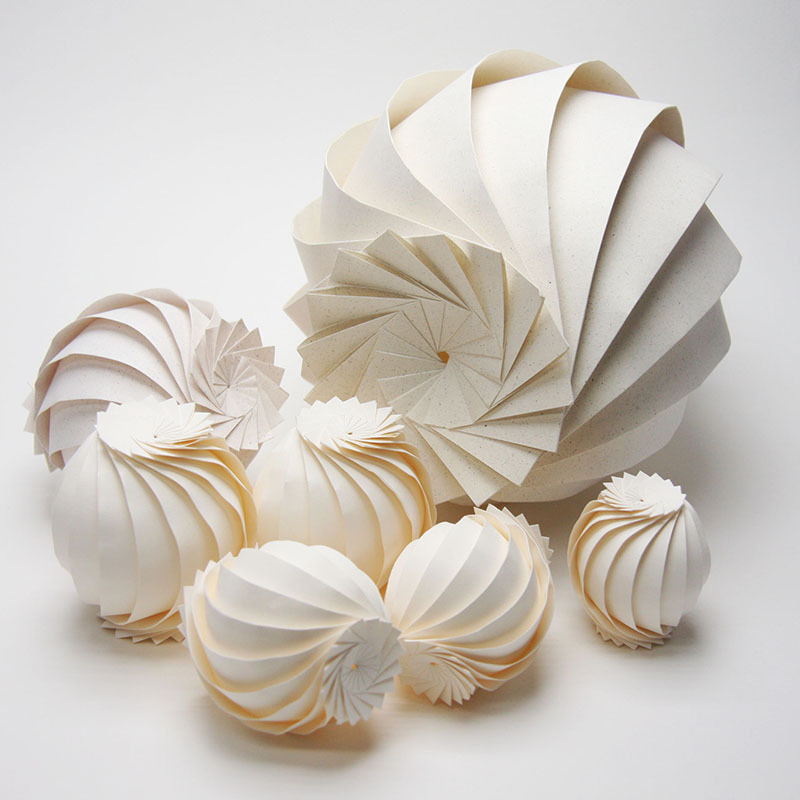 However, just by adding the steps of folding the paper, we can create various shapes, including the “spheres” pictured below. 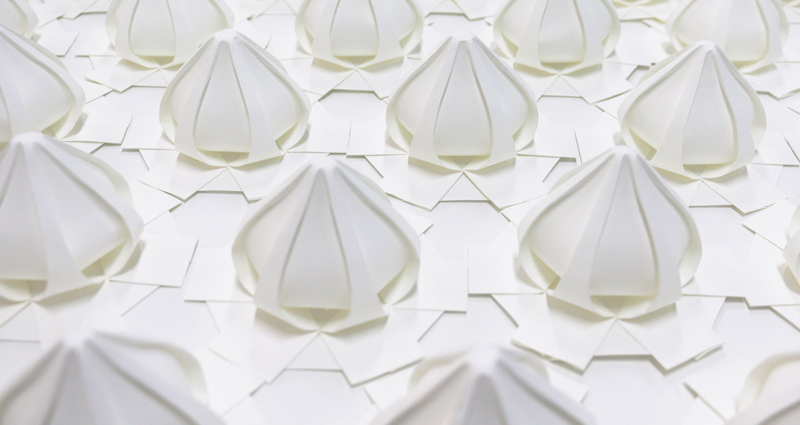 Three-dimensional origami is made by gathering the curved surface made by a piece of paper. Furthermore, when unfolded back to a flat piece of paper, it is required not to have any gaps or distortions. Under these requirements, we have to consider what sorts of shapes we can create, and how to go about planning and designing it. A wide range of mathematical thinking skills is often needed here, from the easy theories to the difficult ones. Origami is an amazing form of art in which both the process of thinking mathematically, and the joy and wonder of creating beautiful figures and shapes, can be enjoyed at once. I have uploaded many of my works on “Flickr“, an online photo sharing platform. Unfortunately it is only in Japanese, but I also have a web page, “Origami Research Notes”, where the findings and materials related to the research of origami which I have put together, can be seen. Check out the above pages, and please take a look into the world of origami that you have never known before. It would be my pleasure if you would be able to feel the the magnificence of mathematics through the shapes of origami.